Home Window Tint How Dark is Limo Tint & Is It Legal? Whether you’re a car buff or you’re just starting your research into upgrading your car with automotive window film, chances are good that you’ve seen or heard of “limo tint” before–possibly without even realizing it. This extremely dark form of window tint appeals to many Valley drivers for its heat- and light-blocking shade, the privacy it provides, and its sleek look. However, if your tint is too dark, you may find yourself getting pulled over by Arizona’s finest and racking up citations. It’s important to know what classifies window film as a “limo tint” and whether it’s legal in Arizona or not. Limo tint refers to a type of automotive window film that blocks out 95% of visible light and only allows 5% of light into the window. (also known as 5% VLT, or visible light transmission). From the outside, very little can be seen of the vehicle’s interior. Arizona state law restricts limo tint to the back side and rear windows, allowing for no darker than 5% VLT. While 5% VLT tint is legal, a police officer can still issue a citation if they find that the tint of your vehicle’s windows impedes your view or distracts you from driving. Examples of legally dark limo tint that might still get you pulled over includes tint with smudges, bubbles, tears, or lines. Additionally, if your vehicle has tinted windows, you are required to have dual side mirrors to compensate. Legal limo tint is an easy upgrade for Arizona drivers seeking privacy and protection. Contact Us Today for Your Limo Tint Quote! 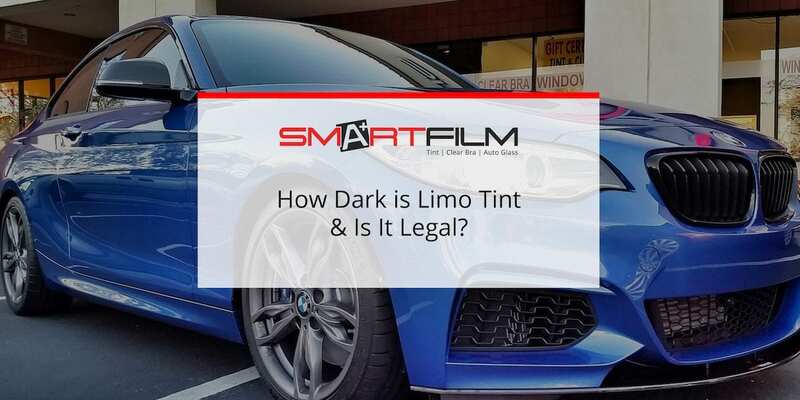 Let the professionals at Smartfilm handle your limo tint installation and leave the legal guesswork out of the equation. Call our office today for a quote on our limo tint installation and other services we provide customers across the Valley.